For over 30 years, dedicated volunteers have been helping to meet the issue of food insecurity head-on in our community. We are neighbours helping neighbours. Why not join us? Monday, April 29, 1:30-3:15 p.m.
Wednesday, May 29, 1-2:45 p.m.
Thursday, June 27, 6-7:30 p.m. Check back regularly for future dates! Click on the program areas below to read about volunteer opportunities. Warehouse: volunteers work as a team in the spirit of the Centre receiving, sorting and stocking shelves to ensure the timely delivery of food products to the Centre’s food bank clients. Ability to lift 30-50 lbs is an asset. Commitment: 3.5-hour shift weekly. Must be more than 16 years old. Food Bank: volunteers ensure that each shopper understands the point system for food items and is treated with dignity and respect. Hamilton Community Food Centre Programs – Volunteer Opportunities available! Market volunteers help run a fresh fruit and vegetable market for the community. They set up and/or take down market equipment, arrange and present produce in an appealing way, label foods according to price list, and conduct a closing inventory. Customer service skills and friendly personality are assets. Priority will be given to Rolston Neighbourhood community members. Commitment: 4-hour shift per week. Must be 16 years or older. Homemade Cafe volunteers help our customers at the community market stand and serve them in our cafe. It’s a fun, fast-paced shift! Gain useful customer service experience! Produce Market receivers are responsible for receiving shipments of fresh produce and sorting produce for various community programs. They ensure all produce ordered has been delivered in good condition, and clearly label and sort items for various community programs including community meals, food skills programs and markets. Commitment: one ½ day shift per week. Must be 16 years or older. Meal Service volunteers assist with serving food to guests during Community Meal programs. They welcome and seat guests, and provide exemplary table service throughout the meal in a comfortable and dignified environment. Commitment: 3.5 hour shift weekly. Shift times and availability will vary according to program schedule and demand. Must be 16 years or older. Meal Preparation volunteers assist with many different tasks in our Community Kitchen and support Program Coordinators in preparing foods for various programs at the Centre, including Community Meals. Drop-In Program volunteers welcome guests to our Drop In Meals. They provide guidance for new and returning guests seeking more information about programs. Drop In Program volunteers provide leadership and direction. Commitment: 3.5 hour shift weekly. Must be 16 years or older. Special Event assist staff before, during and after Special Events. Special Events could include community gatherings, film screenings, forums, town hall meetings, holiday celebrations, etc. Commitment: Special Event volunteers are periodically required. Must be 16 years or older. Intercultural Community Kitchen volunteers help with set-up, food preparation and clean-up in the community kitchen space, and are passionate about the benefits of fresh and nutritious food. Spanish, Arabic, Kurdish and knowledge of other languages is an asset. After School Program volunteers help to deliver fun, engaging and informative programming to school-age youth. They enjoy working with young people and help to keep focus during cooking and gardening activities. Commitment: 4 hour shift weekly. Must be 16 years or older. Garden volunteers help with general maintenance of community gardens and patio space. General duties include seeding, planting, watering and weeding and assist staff with garden programming. Must be comfortable doing physical work and being outside. Gardening experience is a requirement. Educational Consultants ensure that N2N educational support programs align with Ministry of Education curriculum. Educational Consultants must be proficient in teaching small and large groups as well as providing individual support to N2N tutors. Educational Consultants are responsible for decisions regarding the planning, implementation and evaluation of the program. We are currently seeking Educational Consultants for our literacy and numeracy programs.Commitment: Monthly commitment varies, but approximately 5-8 hours from September to June. Neighbour to Neighbour Jack Parent Reading Program: volunteers commit 2 to 3 hours with 4 or 5 grade 1-3 students at selected schools during the school day.Commitment: Once weekly October to May. Must be more than 16 years old. Math Success Program: Adult and youth volunteers tutor students in gr. 7 and 8 on Tuesday and Wednesday after school, October-December 2018 and February-May 2019.Commitment: A weekly commitment of 1-3 sessions from February-June. Program is approximately 15 weeks in length so 15-45 hours is required. Training will be provided prior to and during the program. Community Involvement hours will be credited for youth volunteers. Community Counsellors: provide information and access to community resources, help to identify options as well as validate the client’s experiences. Counsellors provide assistance with a variety of issues related to poverty, employment, family violence, health concerns and legal problems. Commitment: 3-hour shift weekly. Must have post-secondary education or work experience. Clerks: maintain a high level of customer service in the Used Book Store. The store is a social enterprise, housed in the Neighbour to Neighbour Centre and open to the public that generates revenue for Neighbour to Neighbour Centre programming. Commitment: a 3.5-hour shift weekly. Must be more than 16 years old. Speakers’ Bureau: make presentations to interested churches, schools and groups on Neighbour to Neighbour Centre’s programs and services. Commitment: 1 hour per month as needed. Must be more than 16 years old. 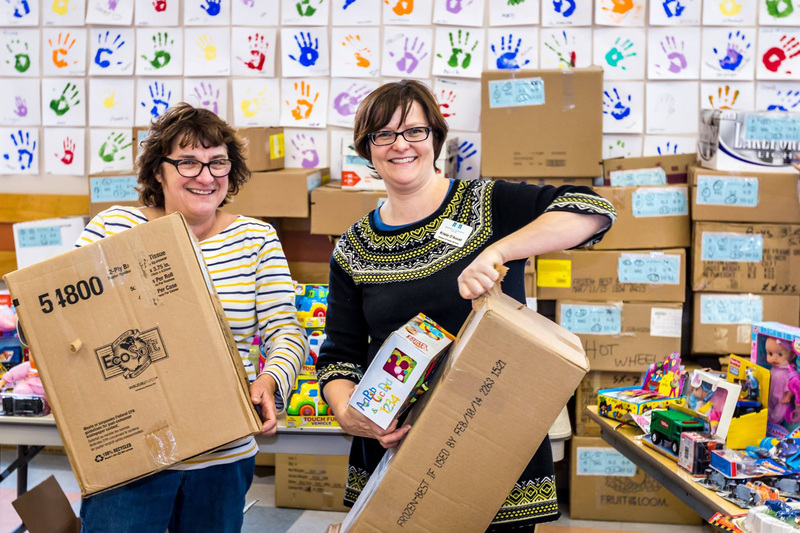 Warehouse (November and December only): volunteers work as a team in the spirit of Neighbour to Neighbour, receiving and sorting food donations to ensure the timely stocking of food products on our shelves.Commitment: 3.5-hour shift weekly. Must be more than 16 years old. Christmas Food Bank (November and December only): volunteers ensure that each shopper understands the point system for food items and is treated with dignity and respect.Commitment: 3.5-hour shift weekly. Must be more than 16 years old. Toy Room: volunteers sort new donated children’s toys by suitability to age. Commitment: flexible, depending on your availability. Christmas Toy Store: volunteers set up the store, float between the store and Neighbour to Neighbour to maintain tables stocked with toys; assist shoppers with carry-out; and ensure each shopper is treated with dignity and respect.Commitment: One or two 4-hour shifts from December 13-16. Must be more than 16 years old.